Volotea started a new promotion and offers a discount code for all passengers traveling in 2019. With this special Volotea promotion code, you can save 35€ from your return ticket! In order to get the discount, just click on the button below and use the displayed promo code during your reservation. You can switch to your language in top right corner if needed. This Volotea promotion code is valid for purchase before 6th August 2017, and for flights until March 2018. If you use this coupon code for example in group of 2 people on return flight, you save amazing €70 (see example below)! For Supervolotea members, you will get up to €25 discount per person with this coupon. The savings will be applied only to the fare price and are eligible for return flights only. The code works until end of March 2019 for travel dates until end of June 2019 for flights with a cost of between 35 and 75 Euros. Here’s brand new discount code for €20 off on return flight! The code works until 17th November 2017 for flights with a cost of between 35 and 75 euros until April 2018. We have another brand new Volotea discount code for you, this time for €15 off for one-way flights (or €30 for return tickets if booked separately!). This Volotea promo code works for all one-way flights offered by Volotea with price between 35 and 100 Euros. For Supervolotea members, applicable discounts are up to €8 person and route. The discount code is applicable for reservations until August 6th for flights until March 2018. Volotea sent us a brand new promo code for €15 discount on one-way flights, which means you can save €30 on your return ticket! The discount is valid until 25th June 2017 for flights from July 23rd until March 2018. 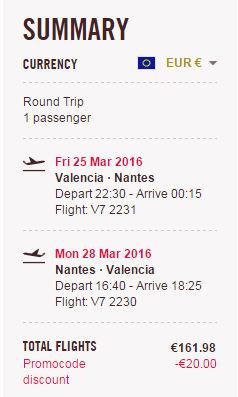 We have a new Volotea promo code for nice €15 discount. This Volotea discount code is valid for one-way flights to any destination in Volotea network. The offer is valid until May 31st (included) to fly from June 29th until March 2018. This discount code can only be used on reservations with a cost of between 35 and 150 euros purchased through volotea.com. Volotea sent us another great promo code for €20 discount! This Volotea discount code is valid for up €10 per passenger and one-way leg (€20 total discount) and applicable for reservations until April 23th (included). Allowed travel dates are from June 1st until December 14th 2017 and you must book roundtrip flight. This discount code can only be used on reservations with a cost of between 35 and 150 euros. Volotea sent us a brand new discount code for €15 discount on one-way flights. This Volotea promo code gives you up to €15 discount on your booking if you book one-way flight until 31st March 2017. Allowed travel dates to fly are from March 29th until November 2017. How to apply this Volotea discount voucher? In this new example we tried to book return flight from Marseille to Dubrovnik in July 2016 with this updated €15 discount code. As you can see, the discount is really calculated for both directions as it is a return flight and you get a massive €30 discount in total! Volotea is a Spanish low cost airline company headquartered in Barcelona with additional bases in Spain, Italy and France. Volotea was founded by Alaeo S.L. from Barcelona, a company created by former Vueling founders, Carlos Muñoz and Lázaro Ros. The name “Volotea” originates from the Spanish verb “revolotear,” meaning “to fly around.” It started operations on 5 April 2012, from Venice Marco Polo Airport. Boeing announced on 15 February 2012 that it had signed a long term lease deal with Volotea for an unspecified number of Boeing 717 aircraft. In March 2015, it was further announced that Volotea will receive four 717s from Blue1. However, in November 2015, Volotea announced to phase out their 717 fleet in the next few years and replace it with Airbus A320 family airplanes. Check out also this nice Volotea video celebrating their 8th million passenger. Enjoy your discounted flight with Volotea! « WOW! Super cheap flights to USA: Boston for €157! 12 Secrets to Booking a Really Cheap Flight! WOW! Cheap fligths to Sri Lanka for only €259! AirBnB: one night accommodation up to €200 for free! HIT! Cheap flights to Australia for only €382! WOW! Super cheap flights to Brazil for only €190!! MEGA HIT! Cheap flights to Brazil for only €262! Cheap direct flights to Maldives for only €359! Cheap flights to Colombia: Bogota for only €415! Cheap last minute flights to Dominicana: Punta Cana for €275! WOW! Cheapest flights to Cuba in history: Havana for only €179! HIT! Super cheap flights to Cayman islands for only €268! Get €600 back for your delayed flight with AirHelp! Cheap flights to Canada: Vancouver for only €333! Cheap flights to Cuba: Havana for only €359! WOW! Cheap flights to Brazil: Rio de Janeiro for only €357! Stay updated with latest deals and cheap flights! Don't want to miss next €220 deal to New York or Bangkok? Sign up for our occassional newsletter.